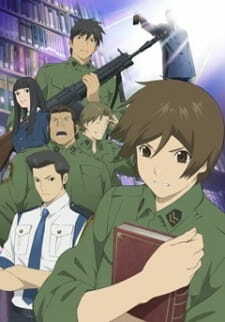 Toshokan Sensou (or The Library Wars), is another one of those odd anime that I seem to end up reviewing. The show has a nice premise which is reminiscent of Orwell's 1984 and Bradbury's Fahrenheit 451 all rolled into one. The anime is based on a series of four light novels by Arikawa Hiro (entitled Toshokan Sensou, Nairan, Kiki, and Kakumei respectively), which were published from 2006 to 2007. The novels were later serialized in two mangas. The first manga was made by Yumi Kiiro, and published in Lala magazine from September 2007. The second was made by Furudori Yayoi, and was published Dengeki Daioh magazine from November 2007. The twelve episode anime was made by Production IG, and released in April 2008 on Fuji TV's Noitamina (which is animation written backwards) timeslot. The basic plot for the novels is based on the &quot;Statement of Intellectual Freedom in Libraries&quot; that went into effect in Japan in 1954. The story is set 30 years after Japan passed the Media Enhancement Act in 1989, a law which effectively gave control of all published material to the government. The law was passed in an effort to censor any media that could be deemed as hazardous to Japanese society, but 30 years later blanket censorships, book burnings, and a culture of fear and exclusion have become the norm for society, as Media Enforcement troops are everywhere. Because of this, and because of a tragedy that occured 20 years prior to the beginning of the story, the libraries now have their own defense forces, and the main character, Kasahara Iku, joins the Kanto Library Defense Force as she was saved by a member of the that team some years back. The show follows her struggle to become a good librarian and a good member of the defense team. The art style is very much hit and miss. Although the characters are nicely designed Production IG have adopted a style that has quite noticeable black borders around characters and objects. This give the show a far more &quot;cartoony&quot; feel than it should possibly have, especially during the dramatic moments. This &quot;cartoony&quot; feel can be off putting to some people, whilst others may be oblivious to it. The backgrounds and settings are well designed, but overall they aren't anything special. The animation itself is usually quite smooth and flowing, although there are some glaring faults (the scene in episode 11 with a van crashing through a barrier made from two buses and receiving no damage is a prime example). The sound is okay overall. The OP is nice, if unmemorable, as is the ED. The VA's are quite good overall. Inoue Marina plays the role of Iku very well, and her voice suits the design of the character. The same goes for the rest of the VA's with their resepctive characters. The sound effects are pretty good throughout the show. Most of these are used in the more dramatic or action filled moments to good effect. The characters weren't bad on the whole. Iku is a nice enough lead on the whole, although I found it a little off putting that she is a stereotypical &quot;jock&quot; (i.e. all muscle and no brain). She is determined and caring, but coupled with that is a short temper, reckless behaviour, a dislike of serious study and classrooms, and a endency to overreact. This can make her character confusing as it's sometimes unclear how the show is trying to develop her. The other characters (Doujo Atsushi, Shibasaki Asako, Tezuka Hikaru, etc), receive very little development throughout the course of the show, especially given the fact that the show is about Iku. This makes the show unbalanced as, although we are clear about what drives Iku, we are rarely shown any of the other chaacters' motivations. Here's the reason why I said this show is a bit odd. It never seems to settle on being one thing as it has drama, action, suspense, comedy, and even romance all mixed into it. he unfortunate thing though, is that it never quite pulls of the comedy, the romance is a little on the limp side, the drama is sometimes hammed up, and the suspense is normally easy to work out. Couple this with the cartoon style art and the show is difficult to take seriously. However, the show is enjoyable on the whole, especially if you don't treat it as a serious anime. It's effectively a coming of age story and as such it actually works on quite a few levels. Toshokan Sensou isn't a bad show on the whole. Yes, there are some obvious failings in the show, but it is still rather enjoyable in a no-brain kind of way. I wouldn't recommend it to anyone who wants a serious show, or to anyone who wants a comedy. Although the basic premise is a serious one, the show works better as a straightforward action anime, and as such it's not a bad way to waste half an hour (hence my overall score of 7). If you're going to watch the show then don't have any expectations of high drama, challenging concepts, or any kind of socio-political message. It doesn't require any introspection or deep philosophical ponderings, and the best advice is to watch it in the same way you'd watch Die Hard, Rush Hour, or any other action movie. I just happened to hear about this anime by chance from another website. The premise was interesting so I decided to give it a try and was totally amazed. The storyline, characters, artwork, and sound are engrossing and completely draw you in. While the characters themselves may not be completely unique, their interactions with one another and the realistic emotional outbursts are i think rare among most anime. Most people don't really mention this but I also consider this a full romance. The relationship between the main characters develops more naturally over time. They are not sappy or fake but there was a lovely tenderness and protectiveness towards one another that was great and heartfelt. And in this anime you definitely get a somewhat satisfying ending vs. most animes that leave things very open ended. I am hoping hoping for a second season because my only complaint would be that this anime was way to short. The storyline is smart with strong sociological undertones. The advantage is you can choose to really ignore the important issues if you want to you. You can enjoy the action, comedy and romance alone or you can also appreciate the underlying message and concept. Either way, I don't believe it will diminish your enjoyment of the show. So overall witty and lovable characters, great story, nice artwork.. this is now one of my top fav. animes of all time. I tried really hard to hate this anime. I watched the first episode and I was absolutely geared up to hate the whole thing and bring all my negative emotional baggage down on it. I failed. I fell in love with this anime. It deals with a war very unlike Western wars, and with laws very unlike Western laws. In the real world war is incredibly lawless and ugly, and law enforcement is terrible. But this anime deals with an extremely civilized war with very strict rules of engagement, very limited weapons, and scrupulous regard for human life, so it's not like watching documentary footage of real wars. The war is also in effect a limited civil war, so it's not like any war story I can recall ever having seen before. This anime is short but extremely complete. The visuals are gorgeous. The character development, plot, and pacing are very well-balanced. It packs a huge amount of energy into a very concentrated package. Obscure trivia note:The main character of Mahou Shoujo Tai Arusu was played by Kojima Sachiko, but for whatever reason, I keep thinking that she sounds exactly like Inoue Marina playing the main character of Toshokan Sensou. This was probably one of the best decision to watch back in 2008. The story is about a special trained military force for the &quot;Library&quot;, to protect good, fun and important books. It sounds intresting, but not good enough. The characters and the art help you through the series, in which the story develops nicely. The characters are done great, their backgrounds, relations and personalities, they really look like humans which just got animated, through their personalities that is. The art is okay, sometimes they could've drawn more realistic, some female characters look too much on their male co-characters. But that's probably meant to be that way, since, when you get to know a softer side, you get to see how beautiful she actually is.